Before education, before my wife and kids, my first love was baseball. I began playing baseball as a young child and still play it today in a my 28 and over league. Through baseball I learned discipline, team work and determination; all things that have carried over into my life as an educator. I received a scholarship to play at the collegiate level at Point Park University. I truly believe that without baseball, I would not be the man I am today. 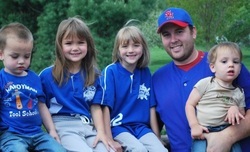 Not only do I still play, but have coached two of my daughters' and both of my sons' teams.